Unlike Vitamin D3, Vitamin K2 is not widely well known in western culture nor is it widely available in the western diet. However, breakthrough research is showing the crucial role K2 plays in the battle against cardiovascular disease. Calcium build up in the arteries is a major risk factor for heart and cardiovascular disease. We have all likely heard of the importance of maintaining optimal Vitamin D levels. One of the major functions of Vitamin D is to aid in the absorption of Calcium. However once Vitamin D completes it�s job of aiding calcium absorption, it then plays no role in determining where this calcium is stored. This is where Vitamin K2 comes in. When K2 is not present in sufficient levels, the calcium that is absorbed (with the help of Vitamin D) is sent to our soft tissues which leads to vascular calcification, kidney stones and cardiovascular disease . When K2 is present it ushers calcium to our bones where it provides optimal health benefits. Essentially, Vitamin D and Vitamin K2 are teammates working together to usher calcium away from the soft tissue of the body and into the skeletal structure. It cannot be overstated how important it is to get calcium to the bones. It should also be noted that when there is more than one version of a particular ingredient, Health Thru Nutrition uses only the most effective. 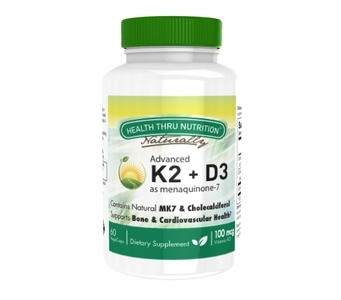 The MK-7 version of Vitamin K2 is biologically active longer than all other forms, and this is the version found in Health Thru Nutrition's Advanced K2 plus D3. K2 also plays a crucial role in inhibiting cells from growing out of control, supporting healthy insulin sensitivity, reducing visibility of varicose veins, supporting optimal dental health, supporting testosterone production and supporting cognitive function. Vitamin K2 was once considered the lost nutrient. It's been found again, sourced for effectiveness and combined with Vitamin D3 to provide you with the comprehensive, forward thinking health product you've come to expect from Health Thru Nutrition. ** If you are on a prescription blood thinner consult a physician before adding K2 to your Vitamin regimen. Other Ingredients: Hypromellose, microcrystalline cellulose, modified food starch, magnesium stearate, sucrose, silicon dioxide, medium chain triglycerides, sodium ascorbate and DL-alpha tocopherol. Free of: Milk or milk by-products, egg or egg by-products, fish or fish by-products, shellfish or shellfish by-products, tree nuts, wheat or wheat by-products, peanuts or peanut by-products, soybeans and soy by-products. Directions: Adults: Take one (1) vege-capsule daily with a meal as a dietary supplement or as recommended by your healthcare professional. WarningIf you are on a prescription blood thinner consult a physician before adding K2 to your Vitamin regimen.